Capt. Brett Wilson is a second generation fisherman. His father had a fishing charter boat out of Rock Harbor for over 20 years. He started as a mate on his father's boat at the age of 10 years old. He mated on many different boats, in many fisheries, gaining a diverse knowledge of the ocean, the many species of fish, and how to truely run a boat. At the age of 18, Brett received his captain's license. With his license in hand, Capt. 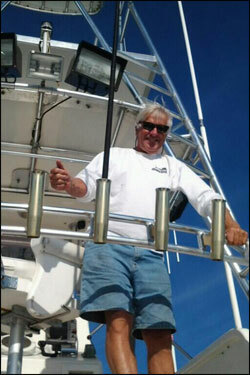 Brett headed to the Florida Keys, where he furthered his career mating for some of the best captains in the world. In the Florida Keys, he had the opportunity to mate and captain several boats. This allowed him to gain a whole new knowledge of a distinctly different fishing environment. To this day, Brett fishes over 300 days per year. 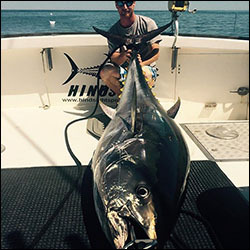 During the winter months, he captains fishing charters as well as sailfish tournament teams. 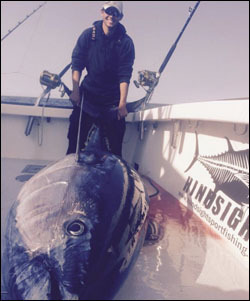 During the summer months, he is on the Hindsight in Cape Cod running charters fishing for bluefin tuna, striped bass and bluefish. When fall rolls around, Brett is a commercial fisherman for giant bluefin tuna. Then it's back to Florida to start the tournament sailfish season again! Captain Buddy Wilson has been a Cape Codder since the late 1940's. Fishing for the last 68 years, starting with an 8' pram, and most recently the 40' "High Calibre", Capt. Buddy Wilson has worked the waters of Cape Cod Bay, specializing in striped bass, bluefish, and flounder, out of Rock Harbor. Capt. Buddy Wilson continues to fish, running charters out of Rock Harbor with his son, Capt. Brett Wilson, aboard the "Hindsight". Captain Chris Nashville gained a passion for fishing on Cape Cod when he was a young child ,visiting Cape Cod in the summers with his family. He instantlyfell in love with the ocean, and began fishing all the waters of the Cape and beyond, learning at every opportunity the real craft of fishing. After graduating from UMASS Amherst in 2012, he immediately moved to the Cape to continue his passion for fishing. 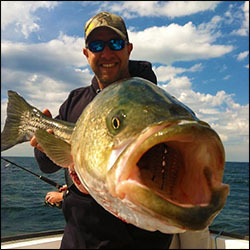 From fishing Cape Cod Bay, to Stellwagon, to the East of Chatham, down to South of the Islands and the Canyons, Captain Chris has learned the best techniques for any and all species you may encounter on the water. From being out on the water to working at a local hunting and fishing shop, he has stayed well versed in the best tackle to use and where the bite is for each season! He holds a 50 Ton Masters and has been in the tackle industry for over 10 years. He has also taken his skill to local media outlets by writing articles for the New England Fishing Magazine, The Goose Hummock Outdoor Guide, and appeared in New England Fishing TV episodes on NESN! Mario is a 50 ton Masters licensed Captain. He is a third generation fisherman and Captain Brett’s nephew. Born and raised on Cape Cod, his life revolves around the ocean. He began working on his Uncles charter boat as a young child and through those experiences was shaped into the fisherman he is today. Growing up, Mario spent his time as a sponsored surfer and fishing the Cape. Mario has worked for many of the boats down at the harbor over the years and is proud to be working with his family. He attends the Massachusetts Maritime Academy, majoring in marine safety science and environmental protection. Salt water runs through his veins, and if he is not in class, you will surely find Mario on the ocean! Mario is known to have a never ending smile on his face, and going the extra mile to make sure his customers have the best experience possible aboard the Hindsight. Capt. Woody Wood has been fishing all of his life. He has been fishing Buzzards Bay and Cape Cod Bay since he was 9 years old when his family moved to Cape Cod. Woody started working as a mate in Rock Harbor when he was 13, honing his fishing skills while learning the Bay. For over 13 years, Captain Woody Wood has been fishing with Capt. Brett Wilson. As a member of the Hindsight team, his knowledge and skill is an invaluable asset. Fishing is truly in Woody's blood. 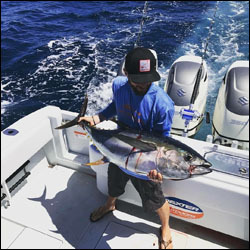 He has been known to work a 12 hour fishing charter, or reel in a thousand pound bluefin tuna, then immediately go freshwater or beach fishing with his family upon his return.